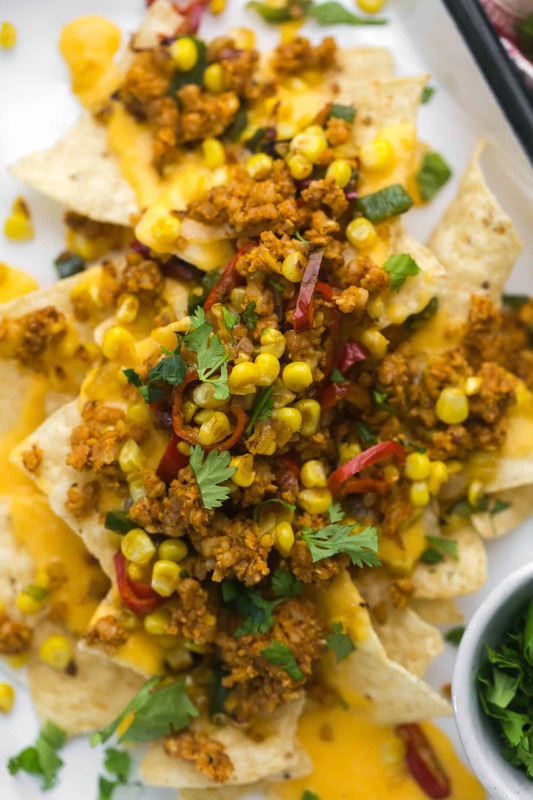 Chorizo-Spiced Vegetarian Nachos | Naturally. This is one of those recipes that after I take one bite, I know it’s a must-share. Yes, it’s kind of involved but I think it’s completely worth it. 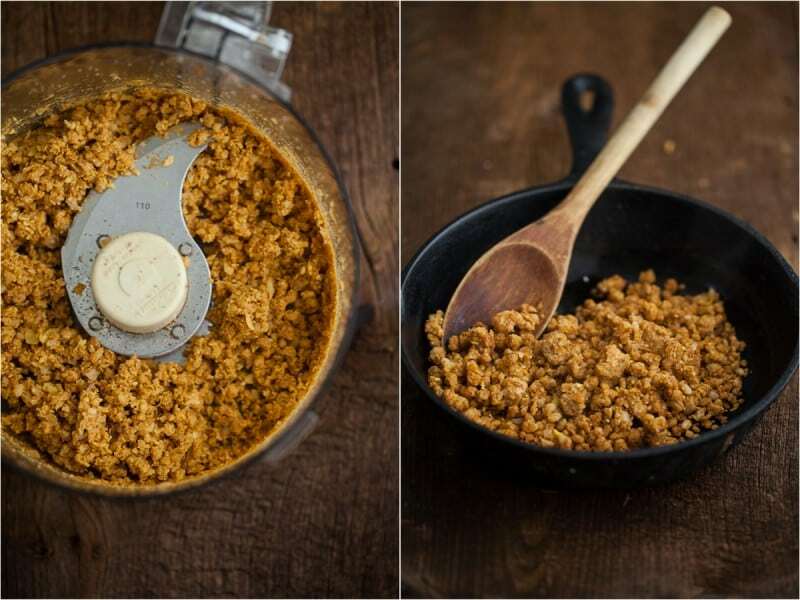 A good chunk of the ingredient list is spices and once you make the crumble, I hope you fall in love with it as much as I did (this chorizo-spiced version is perfect for quesadillas, tacos, and burritos). Not sure you want to tackle the spice blend? You can pick up chorizo seasoning here. These nachos are a great movie or game night snack but we eat these for dinner every so often! 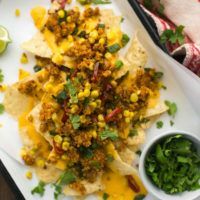 Ready for movie night or house-warming party, these vegetarian nachos are loaded with my favorite pecan crumble, homemade cheese sauce, and easy homemade salsa. Combine the spices, set aside. In a food processor, combine chickpeas, cooked brown rice, pecans, smoked paprika, and garlic powder. Pulse a few times until mixture comes together and resembles a coarsely ground meal. Add in the spice mixture and pulse a few more times to combine, set aside. Heat 2 teaspoons olive oil in a medium skillet. Add the minced onion, red pepper, and corn. Cook until everything is tender and lightly charring. Transfer mixture to a bowl. Heat remaining 2 teaspoons in the skillet and add the nut mixture. Sautee until warm and fragrant. In a medium sauce pan, combine cheddar cheese and cornstarch in a small pot. Heat over medium low and stir until cheddar begins to melt. Add 6 tablespoons milk, paprika, and garlic powder, stir until mixture comes together. Add more milk, 1-2 tablespoon at a time, stirring frequently, to reach smooth and not-too-thin consistency. Assemble the nachos by dividing chips into 4 bowls. Sprinkle with corn mixture, crumble mixture, and a drizzle of the nacho cheese. Serve with avocado, lime wedges, and a sprinkle of cilantro. Tips and Tricks: When making the cheese sauce, err on the side of thicker. It’s easier to think the sauce out with a few tablespoons of milk than it is to thicken it again. One of the reasons I love making homemade nachos is because it can feel a bit over-the-top but as long as you don’t go crazy with the cheese, vegetarian nachos can be loaded and still be healthier. 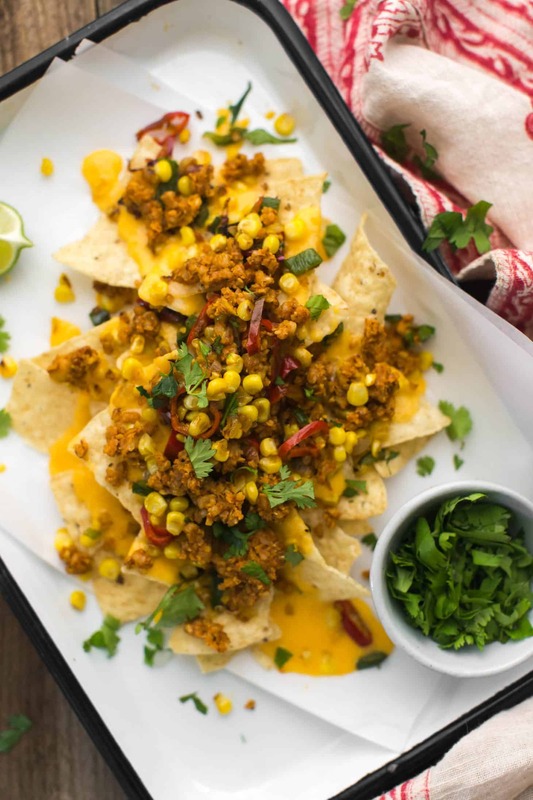 Load up the nachos with extra vegetables and don’t skimp on the chorizo-spiced crumble. Vegetables: During the summer it’s all about sweet corn, zucchini, and fresh tomatoes but when winter rolls around, sweet potatoes and butternut squash are a perfect compliment. Try roasting any and all vegetables before topping the nachos. Vegan: The First Mess makes a mean vegan cheese sauce. 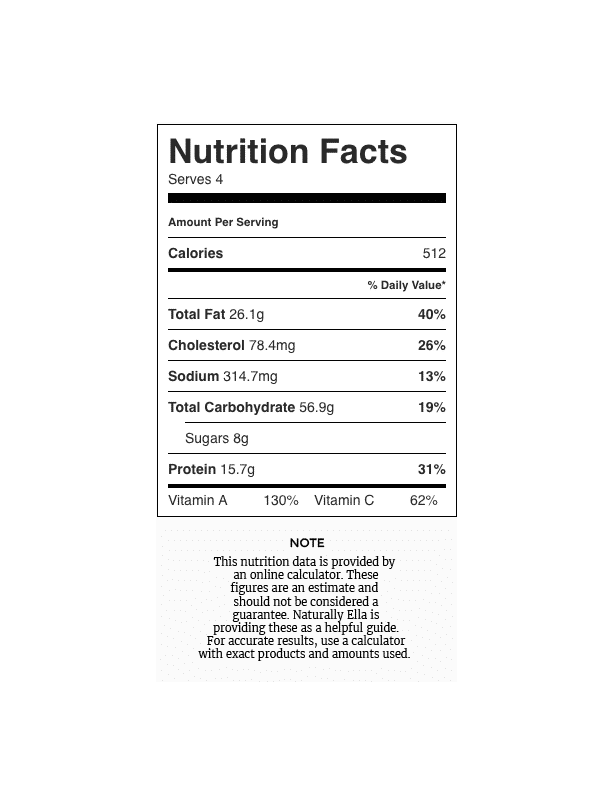 Try this in place of the cheese sauce listed about to make the nachos vegan. Spice Mixture: I went with a mixture that was more based on what you might have in your cupboard and less authentic but if you’re looking to make a mixture a bit more authentic, try this recipe. As mentioned above, I really love the chickpea/brown rice/pecan mixture. It works well in a wide variety of meals and pairs quite well with different flavors. It started out as a vessel for buffalo sauce but has since been used with bbq sauce, spice mixtures (like this chorizo-spiced version), or plain as a salad topping. I’ll take nachos anyway I can get them. Love the chorizo addition! I love nachos. This recipe looks amazing. Hi, can you freeze he crumble? I’ve never tried but I think you could!